Regularly weighing your guinea pigs is good practice - not only does it give you an idea of what weight fluctuations are normal for your pig, but it also allows you to identify potentially worrisome trends, such as a gradual weight loss. As we have written before, sudden weight loss and decreased appetite are some of the first symptoms to show up when cavies fall ill so tracking your pigs weight is essential for their long term health (see earlier post here). Everypiggy here is weighed twice a week. 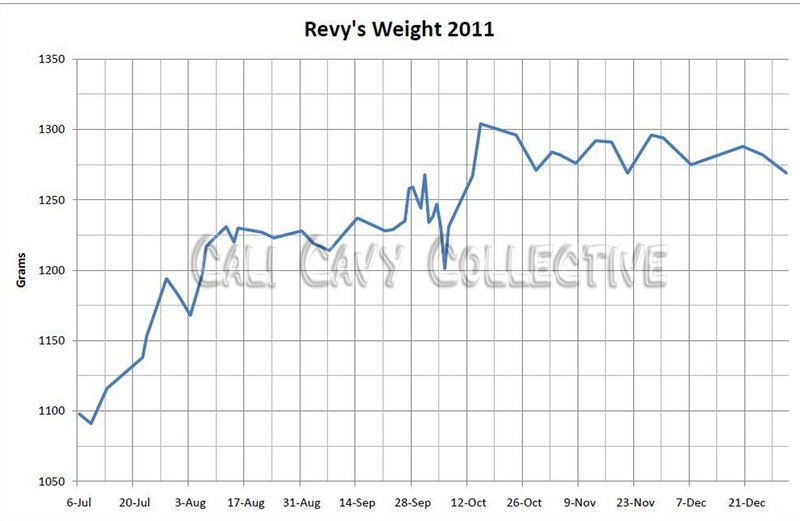 Here is Revy's weight record chart for last year, starting from when she was adopted in July. Since she is a rescue pig we aren't sure exactly how old she was when she came to live with us, we guessed around 9 months. 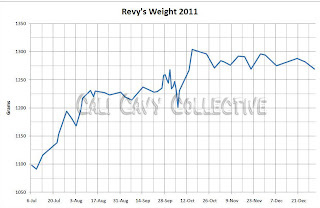 This graph shows her weight in grams (for reference, there are 453.6 grams in 1 pound, 906 grams in 2 lbs, etc).